When Hurricane Katrina hit in 2005 many people did not realize how severe the storm really was. Images were shown on TV and on the Internet, but unless you were there you didn’t have a full understanding as to what was happening and how severe the storm really was. It is tough to say you understand what someone is going through if you have not experienced the same things that they have. 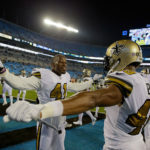 For New Orleans Saints safety Roman Harper, coming to New Orleans nearly one year after the storm was a real eye opener for him. He was coming to start his new life as a professional athlete in a city that was just recently devastated by the costliest hurricane in US history, and until he arrived, even he didn’t have a full understanding as to how bad it really was. “I didn’t know how bad it was out here when I got drafted until I actually got out here and saw the damage for myself. It looked like a bomb went off, it was crazy,” said the Prattville, Alabama native. Drafted in the second round of the 2006 NFL Draft with the 43rd overall pick, Harper has been a leader for the Saints in the community and on the field for some time now. As someone who has been a leader in the community for a majority of his life, coming to New Orleans shortly after Hurricane Katrina was a blessing in disguise for the Saints and the city of New Orleans. The 2009 season was big for Harper and the Saints. Harper played in every game that season for the first time in his young career, was named to his first Pro Bowl, and the Saints won their first Super Bowl in franchise history. Aside from having a big year on the field, Harper had a big year away from it as he started his own Foundation that same year. Working closely with veteran Darren Sharper throughout the years, Darren’s leadership helped pave the way for Roman and his endeavours. The Harper’s Hope 4*1 Foundation was created by Roman and his mother, Princess, as a part of his commitment to serve the communities that have supported him throughout his life. “My mom and I thought about it a couple of years ago and wanted to do something that could help our community. Where I’m from in Alabama we can really use after school programs for the kids so that’s where I wanted to start and we’ve done many things like reading programs and things like that ever since,” described Harper. The mission of the Foundation is to strengthen families and enhance their emotional, social and spiritual health through educational programs, enrichment activities, and economic development. “I want the kids to understand how important education is and that there’s a time and a place for everything. There are good values from back in the day that are still very valuable right now like saying yes, sir and no, sir; yes, ma’am and no, ma’am; respecting your elders and treating people the way you want to be treated,” stated Harper. “All of these values will take you where you want to go and much further. Everyone in this world can achieve anything they want, they just have to have the mindset, the goal and the drive to try to achieve it and education is one of the ways for this to come together and happen,” he continued. One of the other things that Harper enjoys partaking in through his Foundation and team initiatives are the holiday events. Hope for the Holidays is something that he and his teammates take part in every year and they grow more and more as individuals and as a team each year. “Hope for the Holidays is something we do every year and love doing. My teammates and I help build houses and raise funds to rebuild houses that have been destroyed,” described the 2007 Ed Block Courage Award winner. “It has been seven years since Hurricane Katrina and some people are still unable to return to their homes, so we put up $20,000-$60,000 per home,” he added. Harper doesn’t believe that as a professional athlete he ranks higher up than anyone else in the world or is more important than them, but he does understand that as somebody who plays in the NFL for a living and someone who is on TV week after week, people around the country and the world admire his talent so he enjoys taking full advantage of the situation he is in to spread awareness for good causes and deliver positive messages around the world. Although he is all for helping out in the community and thinks everyone should lend a helping hand whenever they can, he still believes that it is up to them, just like every other decision they make in life. “Everything is your own choice. Nobody should be forced to do anything that they don’t want to do. If you just want to look cool and not give anything back, I think that’s bad manners. You didn’t get to where you are today without any help, whether it be a teacher, coach, or your family, someone helped you along the way and you should always try to reach out and give back,” stated Harper. Roman Harper has come a long way since being drafted out of the University of Alabama and has worked hard since day one to earn his spot on the starting roster. His workload off the field has increased, just like it has on the field, but as someone who has big goals and dreams, he’s not close to slowing down just yet. “I want to have my own youth centre somewhere back in Alabama in my hometown someday that will run and fund itself through government aid. I want to see everyone running around and helping each other get better; that’s my goal,” described Harper.